Sunday August 14 1910 I was busy about the work all forenoon. But went to Chautauqua in the afternoon. Gov Hock of Kansas gave a fine address. 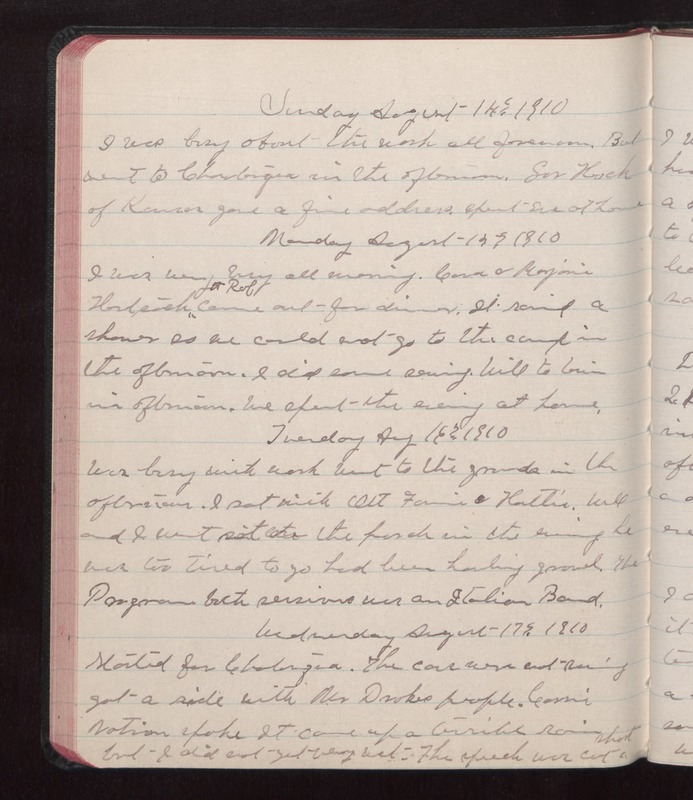 Spent eve at home Monday August 13 1910 I was very busy all morning. Cora & Marjorie Hart sick Rob came out for dinner. It rained a shower so we could not go to the camp in the afternoon. I did some sewing. Will to town in afternoon. We spent the evening at home. Tuesday Aug 16 1910 Was busy with work went to the grounds in the afternoon. I sat with Ott Fannie & Hattie. Will and I went sit on the porch in the evening he was too tired to go had been hauling gravel. The Program both sessions was an Italian Band. Wednesday 17 1910 Started for Chautauqua. The cars were not running got a ride with Mrs Drakes people. Carrie Nation spoke It came up a terrible rain but I did not get very wet. The speech was cut short.